The List of selected candidates published by the Commission in response to this notification shall cease to be in force after one year from the date of finalisation of Ranked List. 5. Method of appointment : Direct Recruitment from approved Probationers in any of the categories of Assistant Excise Inspector, Excise Preventive Officer, Civil Excise Officer/Women Civil Excise Officer. The principles of rules of reservation and rotation prescribed in rule 14 to 17 of Part II of the Kerala State and Subordinate Service Rules 1957 will not apply for this post. The Candidates will be advised in Rank order against the turn set apart for this category along with open quota. 10% of the vacancies reported for the post of Excise Inspector (Direct Recruitment) will be filled from the Ranked List prepared in response to this notification. In the absence of sufficient number of suitable candidates in the Ranked List prepared in response to this notification, the above vacancies shall be filled up by candidates included in the Ranked List prepared for open quota. 6. Age Limit : Must not have completed 45(Forty Five) years as on 01.01.2016. Candidates born on or after 02.01.1971are eligible to apply for the post. 1. Must possess B.A, B.Sc or B.Com Degree of any recognised University or its equivalent In the case of Ex-Servicemen the minimum qualification shall be SSLC. 2. Physical Conditions- Must be physically fit for outdoor work and should possess the following minimum physical standards. Note: No relaxation will be allowed to SC/ST candidates in the matter of chest measurement. Differently abled candidates are not eligible to apply for this post. 2 NCC Certificate holders having ‘A’, ‘B’ and ‘C’ Certificates will be given weight age of marks at the rate of 2% , 3% and 5% respectively. Candidates should produce a Medical Certificate in original at the time of Certificate Verification in the form prescribed hereunder certifying to their physical fitness obtained from a Medical Officer not below the rank of Civil Surgeon Grade II in the form prescribed hereunder, certifying their physical fitness and capacity for out door work. In addition to the above qualification every candidate will be subjected to a Physical Efficiency Test. Their Physical measurements will also be taken before the Physical Efficiency Test. Candidates must qualify in at least five of the under mentioned eight events. 1. If accidents or injuries happen to a candidate while participating in the Physical Efficiency Test, he will not be given further chance to participate in the test. 2. Preference will be given to Ex-Servicemen subject to the condition stipulated in G.O. (MS) 50/70/PD dated 12.02.1970. 3. Ex-Servicemen will be entitled to the relaxations contemplated in G.O(MS) No.71/78/TD dated 08.06.1978 for Physical Efficiency Test. Every person appointed to this post by direct recruitment shall undergo such training for a period of not less than twelve months as may be prescribed by the Department. The period of training shall count for Probation and increment. Every person appointed for this post should within the period of probation pass Account Test (Lower), Excise Tests Parts A & B and DOM or MOP if he has not already passed them. 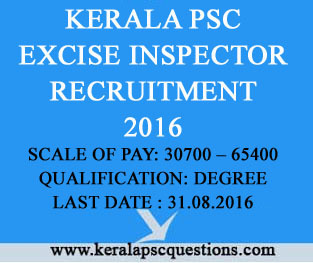 Candidates must register as per ‘ONE TIME REGISTRATION’ with the official Website of Kerala Public Service Commission www.keralapsc. gov.in before applying for the post. Candidates who have registered can apply by logging on to their profile using their User-ID and password. Candidates must click on the ‘Apply Now’ button of the respective posts in the Notification Link to applying for a post. The Photograph uploaded should be one taken on or after 31/12/2010. Name of the candidate and the date of taking photograph should be printed at the bottom portion. The photograph once uploaded meeting all requirements shall valid for 10 years from the date of uploading. There is no change in other instructions regarding the uploading of photographs. No application fee is required. Candidates shall take a printout of the application by clicking the link Registration Card in their profile. Candidates are responsible for the correctness of the personal information and secrecy of password. Before the final submission of the application on the profile candidates must ensure correctness of the information on their profile. They must quote the User-ID for further communication with the Commission. Application submitted is provisional and cannot be deleted or altered after submission. The application will be summarily rejected if noncompliance with the notification is found in due course of processing. Documents to prove qualification, Experience, Community, age etc have to be produced as and when called for. 13. Last date of receipt of applications : 31.08.2016 Wednesday upto 12 midnight. 14. If Written Test/OMR Test is conducted as a part of the selection Admission Tickets for eligible candidates will be made available in their Profile created after One Time Registration and the date of downloading will be included in the Examination Calendar. Candidates can download Admission Ticket for 15 days from this date. Candidates who have downloaded the Admission Ticket will alone be permitted to attend the examination.